Get the free DIY-version or buy Value Card packs. What do you think would happen if someone who values empathy, love, kindness, respect, and humility were to join the same team as someone who values boldness, success, fame, influence, and reputation? Do you think they would collaborate well from the get-go, making use of each other’s unique perspectives to complement and improve upon their ideas? Or do you think they’d be more likely to struggle, misunderstand each other, and face their share of conflict? You’ve probably seen the latter in action. And, to be fair, it’s a much easier pattern to default to. But it doesn’t have to be that way. If team members can make their own values and differences explicit and known, their chance of getting the best from collaborating skyrockets. To help teams improve their collaboration I put together an exercise called Value Cards. With Value Cards, you create a safe space in which team members can explore their values, the behaviors those values shape, and how their values might clash with those of the people around them. But why is making our values explicit so important? Our personality is the unique and relatively stable pattern of our feelings, thoughts, and behaviors. Our values, on the other hand, express our life goals. They are similar to our personality in that they are relatively stable over time, they aren’t visible directly, and we’re often not consciously aware of them. 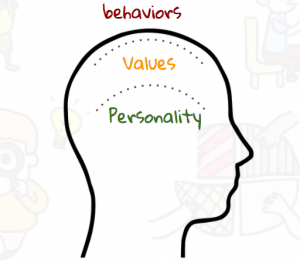 Our behaviors, on the other hand, are shaped by our personality and our values. And unlike our personality or values, behaviors are more within our influence. So if we’re able to identify our values, we strengthen our ability to choose behaviors that are more appropriate to different situations. Hand out one full deck of cards to each participant. Next ask everyone to divide the “important” pile into two new piles: Values that are more important and Values that are less important. Finally, ask everyone to select the 5 most important values from the “More important” pile. If you have time, open up for exploration after each participant has presented their values (timebox to 10 minutes per participant). Let people ask one or two questions that they’re curious about. If anyone asks anything, try the questions below. Ask each team members to present which values they selected and why. If you don’t have as much time, ask one or two questions to the presenter. Follow your intuition and ask questions based on what you personally are curious about. Your questions will help both the presenter and the group to learn about themselves. What behaviors do your values shape out in our meetings? Are there any of these that more often are being put aside by yourself or the group at the moment? What did you discover about us as a team? What do you think we need to pay attention to moving forward? What would it look like if we could truly integrate all these different values and perspectives? As the facilitator of this exercise, don’t try to get the team to agree on a common set of values. The point of this exercise isn’t to get people to change but rather to understand what the people around us value so we can work better together. 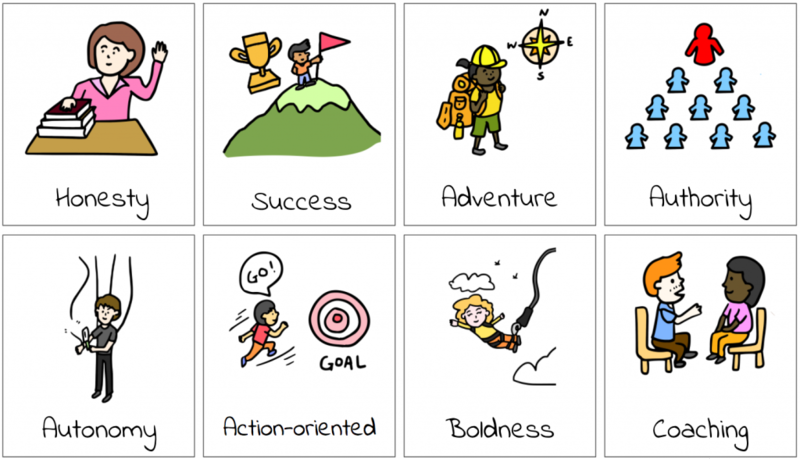 Two of the more important goals with the value cards exercise is to help teams discover their values and to help teams take advantage of their diversity. So that’s all there is to it. Want to get started today? Sign up below for the DIY Value Card set or buy a pre-made set. If you’re running the exercise with a small team, 2-4 people, printing will not take a lot of time but for teams with 10 people or more, there’s a lot of printing and cutting. To help you save time, and to improve reusability, I’ve created Value Cards decks that you can purchase with higher durability (link below). Google Doc DIY-Version. Free PDF Download.